The BT62 celebrates the past and positions Brabham for the road ahead. With a base price of £1m plus local taxes, and before options, production of the Brabham BT62 will be limited to just seventy cars in recognition of Brabham’s seventy-year heritage, with customers able to choose from either the ‘Celebration’ or ‘Signature’ series. The Celebration series comprises thirty-five unique vehicles, each paying tribute to Brabham’s thirty-five Grand Prix victories attained over its thirty-year reign in Formula 1. Each car will be distinctively presented in honour of a specific race win, wearing the colours and race number of the winning car. Chassis number one of seventy, BT62/01, celebrates Brabham’s first ever Formula 1 Grand Prix victory at Rouen-Les-Essarts on 26 June 1964, won by Dan Gurney in the Brabham BT7. Wearing the iconic Australian green and gold racing colours from the BT7, the BT62/01 proudly sports race number 11 from Gurney’s winning car. The wing end plate graphic features a detailed outline of the beautiful BT7 from which its livery takes its cues, along with the corresponding race date, circuit and flag of the host country. The car revealed in London in May celebrates perhaps the most significant race victory in Brabham’s illustrious seventy-year legacy. Chassis number 3, BT62/03, celebrates Brabham’s third Grand Prix victory, with Jack Brabham’s 1966 win at Reims in the BT19, in which he made history in becoming the first driver to win a Formula 1 Championship race in a car of his own construction. The famous red and blue BT46B – the ‘fan car’ – which Niki Lauda drove to its only race win on 17 June 1978 at Anderstorp, Sweden, is celebrated in chassis BT62/19 – marking Brabham’s nineteenth Grand Prix victory. The exquisite attention to detail carries through to the BT62’s interior. A commemorative plaque mounted on the dashboard of each of the thirty-five Celebration series cars details the unique moment in Brabham’s history which the car celebrates. The FIA-approved carbon fibre seat shell matches the exterior of the car, whilst the Alcantara interior trim is finished with corresponding contrasting stitching. This combination of details makes each of the Celebration series cars truly unique in representing and honouring each of Brabham’s thirty-five Grand Prix victories. 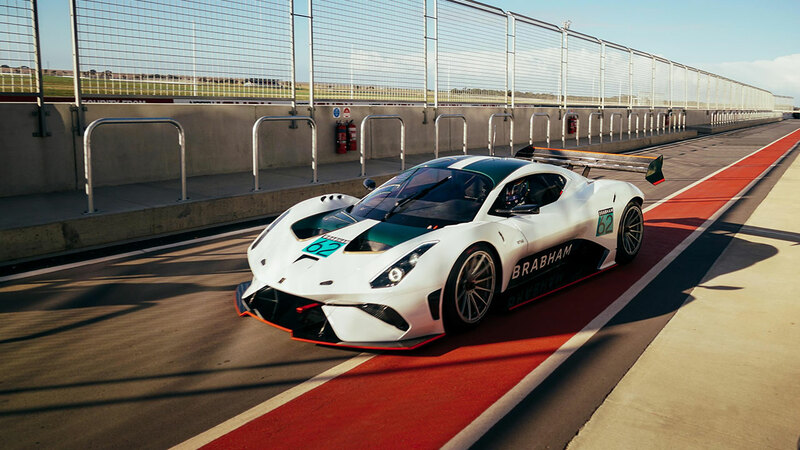 The Signature series will provide owners with an opportunity to work with Brabham’s in-house designers to configure a unique and individual car to depict any other moment in Brabham’s remarkable history, or specify a car that carries their own personal hallmark. Indicative of the how a customer might configure one of the thirty-five Signature series cars, the BT62 was shown for the first time in a new race-inspired livery at Brabham Automotive’s official Australian launch. Unveiled last week in Adelaide, the white and green colour scheme accentuates the shape and exquisite detail of the car’s carbon fibre body, complemented with bold orange accents. The car also features the optional race wheels finished in silver. Among the options available to BT62 owners are a full visual carbon fibre pack, an additional carbon fibre seat shell to accommodate a passenger, as well as the ability to configure the track-only racer as left or right-hand drive. Microsoft’s mixed-reality technology is being used to enable owners to configure, customise and visualise their BT62, allowing them to follow the build process through from order to delivery and beyond. Far more than a celebration of Brabham’s former glories, these very exclusive cars carry distinctive design cues and identifiers that will transfer through to future model variants, clearly distinguishing the Brabham marque and positioning the brand to honour the Brabham legacy and proudly carry its winning DNA on into the future.